A week ago Honda brought Siri Eyes Free integration to its 2013-2014 Accord and 2013 Acura vehicles. The automobile maker said it had additional functionality to announce today, and the news is out. Honda has put a 7-inch “Display Audio” touchscreen in its 2014 Honda Civic and 2015 Honda Fit that is one step closer to Apple’s “iOS in the Car” dream becoming reality. The 2014 Civic will be the first Honda car to come with Siri Eyes Free installed by default alongside Display Audio. “Offering one of the largest touchscreens in its class, Display Audio uses the familiar pinch, swipe and tap functionality of a smartphone to access audio, phonebook, media, vehicle information and available navigation features,” according to Honda. Icons resembling smartphone apps are displayed on a 7-inch, high-definition, capacitive touchscreen, making the interface intuitive and easy to use. Standard internet-sourced music and media options, such as Pandora are built into the Display Audio interface, with the ability to create personalized stations, tap to “like” songs, and view album artwork directly from the touchscreen. Display Audio also integrates touch operation of the volume (with a quick-swipe adjustment), menu, and return functions for a modern and sleek look. Standard steering wheel controls compliment the touchscreen features as well. Another part of Honda’s announcement today is its four new HondaLink iOS apps for newer Apple devices that support low-energy Bluetooth. The app suite consists of Connect, Navigation, Aha, and Launcher. 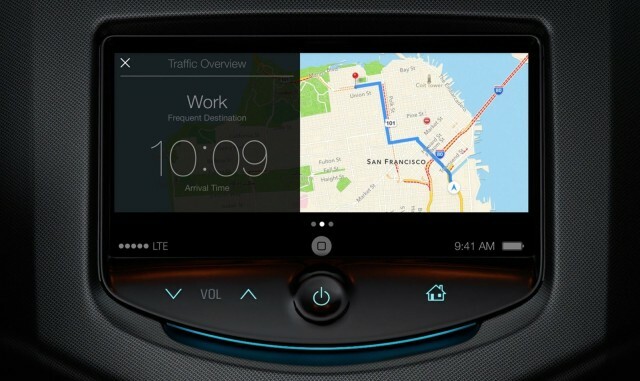 When iOS in the Car arrives, it will look like this, not the software Honda is using in Display Audio. The details behind Apple’s iOS in the Car remain vague, but Honda’s new display should definitely be compatible with the technology. Apple is currently working with a number of car manufacturers, including Honda, on integrating iOS in the Car in upcoming vehicles.